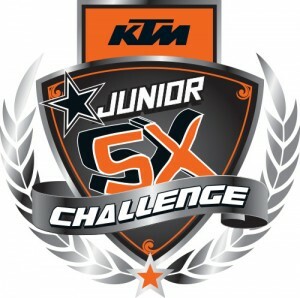 Thank you for your interest in the KTM Junior Supercross Challenge (KJSC). This is truly a unique opportunity for your child to experience the life of a professional Supercross rider for a day! 20 lucky aspiring Supercross riders get to experience the thrill of racing in front of a packed out crowd at the 2017 AUS-X OPEN! Split over two nights, 10 junior riders each night will be treated to a full factory ride, like nothing ever offered before in Australia. Below you will find the official rules and an application form. Please read through all the information carefully. For the riders’ safety, children with at least one year of racing experience are eligible to apply. Today’s Supercross tracks are not playgrounds and present very challenging riding conditions. To make sure the KJSC experience is a positive one, every parent should strongly evaluate if their child’s riding skills are up to the challenge. They will be required to navigate the entire Supercross track. So what can Riders expect if they are selected? Riders/Parents will need to pay a $150 entry fee. Complete the application form in full and include all supplementary documents. Qualified applicants will be selected at random. A drawing to determine final contestants will be conducted 4 weeks before selected event. Please ensure you familiarise yourself with the attached rules and information. NOTE: KJSC participants must be current Motorcycling Australia members on the day of the event to be able to compete. This year, KJSC participants will ride the 2017 KTM 50 SX race bikes fitted with ‘READY TO RACE’ kits that include a range of KTM PowerParts. Before completing the entry form, please be sure your child would like to participate in this event. It may sound like the chance of a lifetime for you and be a nightmare for your child. Consider that your child will be in front of 20,000 live spectators and their main event will be telecast live around Australia and then replayed around the world. As a Supercross racer they will be required to ride over LARGE and technical obstacles. We want this to be a positive experience for your child and everyone involved so please take this into consideration before entering them. The KJSC is intended to be a fun event with the emphasis on sportsmanship and family interaction. Any behaviour to the contrary will not be tolerated and KTM Australia reserve the right to remove any participants who we deem to be breaching this conduct. CLICK HERE TO DOWNLOAD & READ THE 2017 KJSC OFFICIAL RULES & REGULATIONS. We look forward to receiving your entry! Please find the application form below.